I am in the process of building something big and I mean huge. I am on the verge of stepping into a dream I have had, well, my whole life. But just this week I came upon a wall. A big one. I didn’t want to take one more step, take another action. I felt frustrated, doubtful, scared, and completely, thoroughly exhausted. whether your deserve what it is you want. Luckily, I have a mentor, an amazing person who has already done what I want to do – someone who has experienced every wall out there and can guide me to move me past mine. I reached out and he asked me one question, “Laura, what is your why?” (Actually, he calls me Yoga Laura. Kinda like that. 🙂 ) My “Why” is my reason for stepping into this dream of mine, why I want it, why it gets me excited. I stopped, took a breath, and recited what I have recited a hundred times before. And you know what? By the time I was done, I was so excited to get started again I could hardly get off the phone with my mentor fast enough to keep going. There are two things I want to discuss here: Your Why and Your Wall. (Did you notice the photo I chose — why on a wall! Don’t you love imagery!) 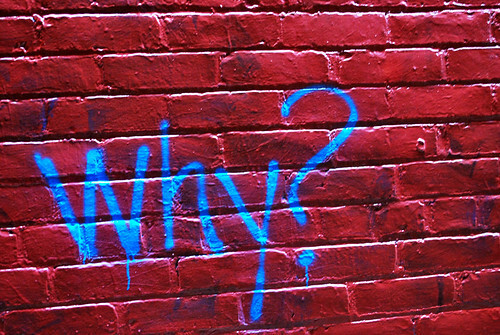 Let’s cover Your Why first, because that is vastly more fun! Look at your life. What changes do you want to make? What is your dream? What you really want in your heart of hearts? And why do you want to do what you want? Here you have to dig deep, and I mean dig. You need to get to the very foundation, the core, of why you want what you want so it resonates with your heart and soul. Yep, I mean it. I want it to be so crazy meaningful for you it moves you to tears. What drives you? What inspires you? What will get you passed all the speed bumps and walls that come up? Mine is so powerful, when my mentor asked me to recite it, I went from depressed to ready to rock in a matter of three or four sentences. Can yours do that for you? Then we have our walls, the incidences that occur that stop us in our tracks, lead us to doubt our abilities and our dreams. All a wall does is bring up our fears, that’s it. And when our fears are up in our lives, nothing seems to work. We don’t feel we have choices and we feel stuck. Walls can feel huge and they can stop us from going forward ever. What triggers your walls? What can stop you in your tracks in just a few moments? When you have a bad night of sleep? When you gain one pound? When your spouse has a bad day? When it is cloudy too many days in a row? When your friends are out of town? We all have our triggers. What are yours? Name them so they don’t have as much control over you anymore. You may be surprised at how inane your triggers are on the face of it. You will be shocked that something so silly can stop you in your dream-creating tracks, keep you from moving forward, and keep you from doing what you want to do to manifest an amazing life for yourself. Finally, you need to know that no matter how far you go or how skilled you get, Your Wall will stop you in your tracks periodically. (Actually it is a mechanism in your brain that is meant to keep you safe.) Your job it to identify it and move on. You can do it! Soooo….are you ready? Ready to rock the world with Your Why? To no longer let Your Wall hold you back? I know you are!